In November 2014, we arranged for Vice Chancellors to participate in a dialogue with philanthropic foundations that have a presence in South Africa. The conference was undertaken in partnership with the Private Philanthropy Circle, a network of local and international philanthropists that make grants in South Africa. 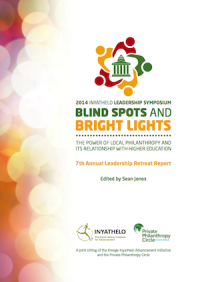 This report is a reflection of the discussions held at this conference and reveals where there is potential for universities to work with philanthropy and where the fault lines may exist.